Materials exposed to neutron radiation tend to experience significant damage, leading to the containment challenges involved in immobilizing nuclear waste or nuclear plant confinements. At the nanoscale, these incident neutrons collide with a material's atoms that, in turn, then collide with each other somewhat akin to billiards. The resulting disordered atomic network and its physical properties resemble those seen in some glassy materials, which has led many in the field to use them in nuclear research. But the similarities between the materials may not be as useful as previously thought, according to new results reported this week in The Journal of Chemical Physics. The disordered atomic networks of glassy substances result from vitrification, the transformation of a substance into glass by its melting and (typically) rapid subsequent cooling. During this cooling, or quenching, atoms don't have time to settle in an organized way, and instead form a disordered atomic network. This led a group of researchers from the University of California, Los Angeles (UCLA) and Oak Ridge National Laboratory to explore the question: Do irradiation and vitrification have the same impact on the atomic structure of materials? Traditional experiments don't allow researchers to "see" atoms directly, especially within disordered materials. So, for their study, the group relied on atomistic simulations using the molecular dynamics technique. "The molecular dynamics technique is based on numerically solving Newton's laws of motion for a group of interacting atoms," said Mathieu Bauchy, an assistant professor in the Civil and Environmental Engineering department at UCLA. "All atoms apply a force on each other that can be used to calculate the acceleration of each atom over time." 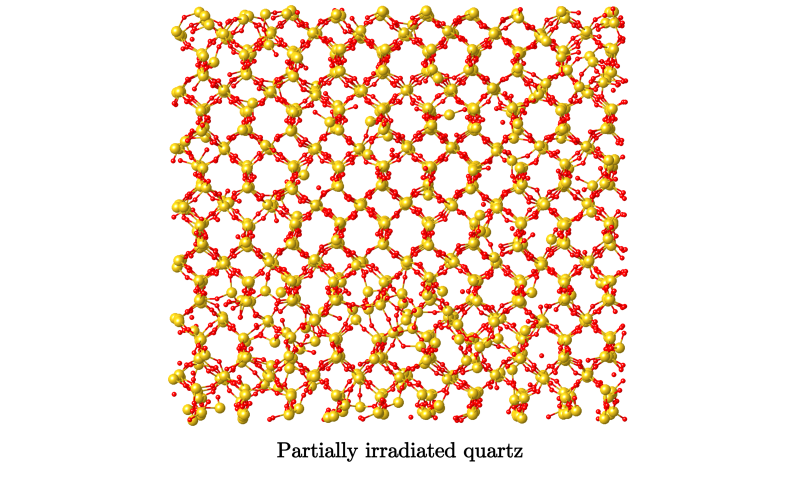 "We also simulated quartz's vitrification by heating and quickly quenching the atoms," Bauchy said. "Finally, we compared the resulting atomic structure of these two disordered materials." "Quite unexpectedly, we found that the disordering induced by irradiation differs in nature from that induced by vitrification," Bauchy said. "This is quite surprising because glasses and heavily irradiated materials typically exhibit the same density, so that glasses are often used as models to simulate the effect of the exposure to radiations on materials." In contrast, the researchers' results suggest that irradiated materials are more disordered than glasses. "The atomic structure of irradiated materials is actually closer to that of a liquid than to that of a glass," Bauchy said. The group's findings potentially have serious implications for the selection of materials for nuclear applications. "First, we suggest that present models might be underestimating the extent of the damage exhibited by materials subjected to irradiation, which raises obvious safety concerns," said N.M. Anoop Krishnan, a postdoctoral researcher also at UCLA. "Second, the different natures of irradiation- and vitrification-induced disordering suggest that glasses can also be affected by irradiation." This is a significant discovery because glasses, which are believed to "self-heal" under irradiation, are commonly used to immobilize nuclear waste via vitrification. "These waste forms are expected to remain stable for millions of years once deposited into geological depositories, so our lack of understanding of the effect of irradiation represents a real concern," Krishnan said. Next, the group plans to explore the effect of irradiation on common aggregates found in the concrete of nuclear power plants and on nuclear waste immobilization glasses. "Ultimately, our goal is to develop novel models to predict the long-term effect of irradiation on the structure and properties of materials," Bauchy said. Decades ago, they irradiated polythene and found it radically improved its resistance to heat. Never figured out why they didn't use this in production. Also, why can't they directly examine the atomic structure of the resultant irradiated material using AFM?